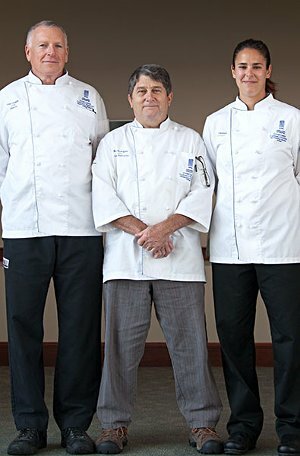 NMC chefs Fred Laughlin, Bob Rodriguez and Becky TranchellFred Laughlin dreams of a day when doctors will write prescriptions for healthy cooking classes. As a first step, the director of NMC’s Great Lakes Culinary Institute is hosting the region’s first Culinary Medicine workshop Sept. 22-24, teaming up with Munson Medical Center and the Groundwork Center. About 50 doctors and other health care professionals are enrolled for a packed weekend of classes aimed at combating obesity, diabetes and cardiovascular disease by teaching patients to live healthier lifestyles. Culinary faculty members Bob Rodriguez, Robert George and Becky Tranchell will join Laughlin as presenters, along with nutritionists, dieticians and clinicians, including keynote speaker Dr. David Eisenberg, associate professor at the Harvard School of Medicine. In 2007 Eisenberg founded Healthy Kitchens, Healthy Lives, an annual conference offered by Harvard and the Culinary Institute of America in Napa Valley, Cal. It serves as the model for Culinary Medicine. Munson registered dietician Laura McCain is part of the planning team and will teach at the workshop. She said northern Michigan’s top three chronic health issues -- obesity, cardiovascular disease and diabetes – can all be improved with better diets. The workshop will provide tools, from budget-minded grocery shopping to food preparation techniques to recipes, that the audience, chiefly primary care providers, can then offer their patients. Physicians earn continuing medical education credits for attending. Laughlin said he expects this first year won’t be the last. “It has a lot of potential to be an ongoing, yearly thing,” Laughlin said.